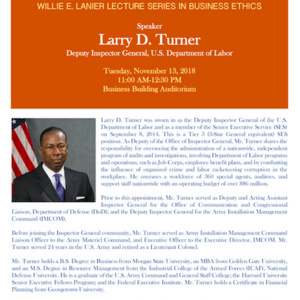 The Earl G. Graves School of Business and Management present the Willie E. Lanier Lecture Series in Business Ethics with invited speaker Larry D. Turner, deputy inspector general for the U.S. Department of Labor on Tuesday, November 13, 2018, from 11 a.m. to 12:30 p.m. at the Morgan Business Center auditorium. This was a wonderful event. Mr. Turner gave wonderful examples for Students, Staff, and Faculty. Glad that he was chosen to be the speaker. He is very professional, caring and wonderful person.